For Thanksgiving, friends Chuck and Jean invited us to their luxurious timeshare resort called Pueblo Bonita at Sunset Beach. 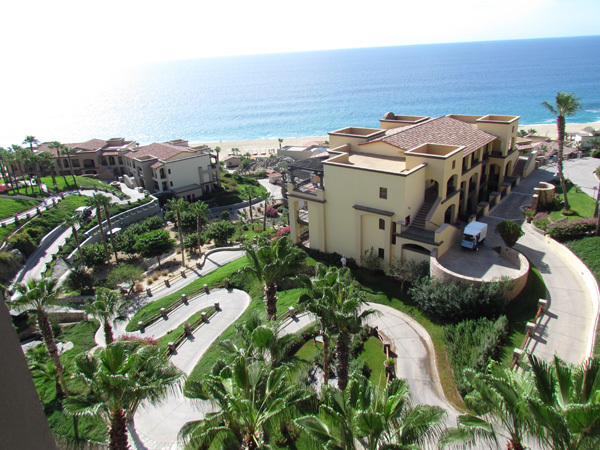 It is located outside of Cabo San Lucas, at the tip of the Baja. 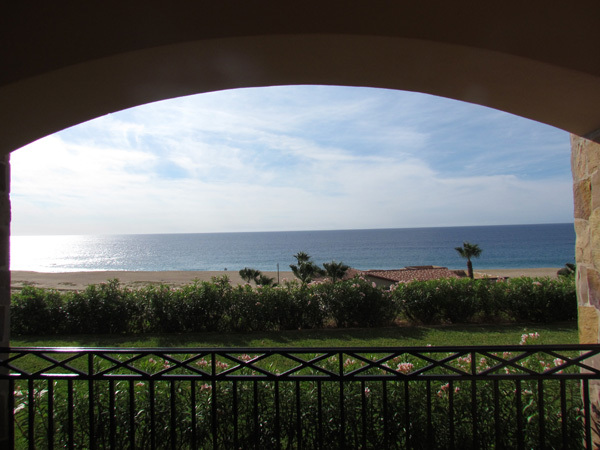 Larry caught this spectacular sunrise from the balcony of their Executive Ocean View Suite looking south where the Sea of Cortez meets the Pacific Ocean. 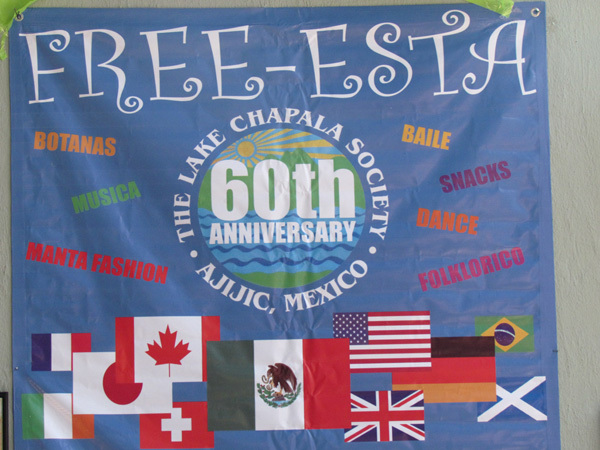 Mexicans are known for their Fiestas and in keeping with the goal of the Lake Chapala Society to be more inclusive within the Mexican community, the theme of their 60th anniversary was “FREE-ESTA.” The FREE-ESTA included various organizations exhibiting their services to both the Mexican and foreigner communities, along with dancers, free food, and live music. It made for a festive day. 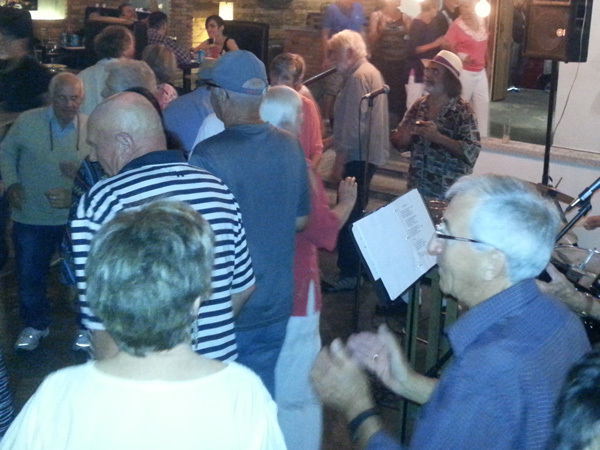 While we were in Ajijic in August, we spent an evening at Adelita’s Bar and Grill, a newly remodel nightclub that has live music every Monday night. So we decided to reserve a table for eight for every Monday from November through March. Being there makes us feel much younger again! One Monday night at Adelita’s, we happened to be seated near our friend Leslie Martin, who was celebrating her XXth birthday. 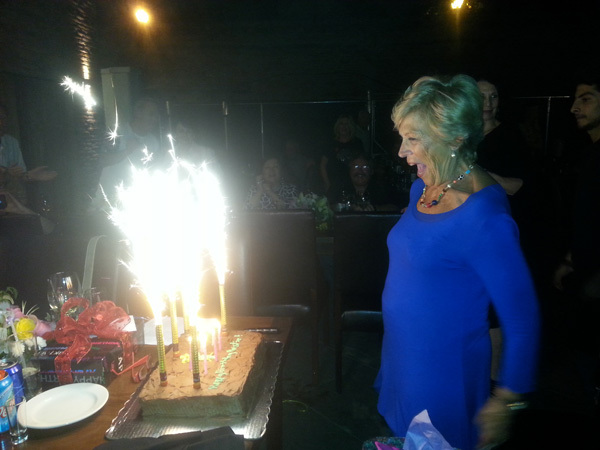 We captured her exuberant expression in watching the fireworks go off on her birthday cake. She didn’t dare blow them out. Friends Patricia and John invited us to their home for appetizers and cocktails and to meet Dusan, who was visiting from Calgary. 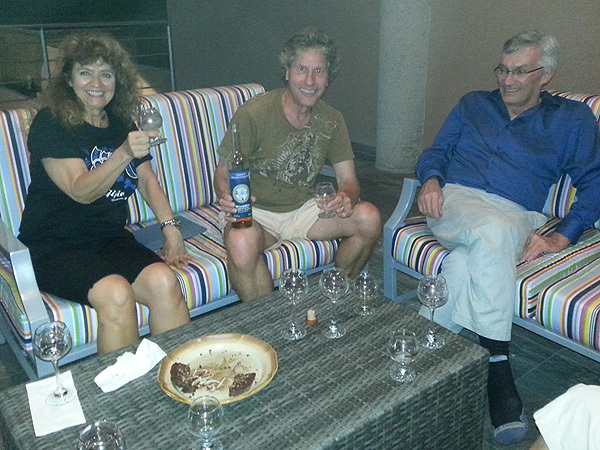 Later in the evening, John introduces us to a mighty fine sipping Tequila he recently discovered that is being distilled south of Lake Chapala. 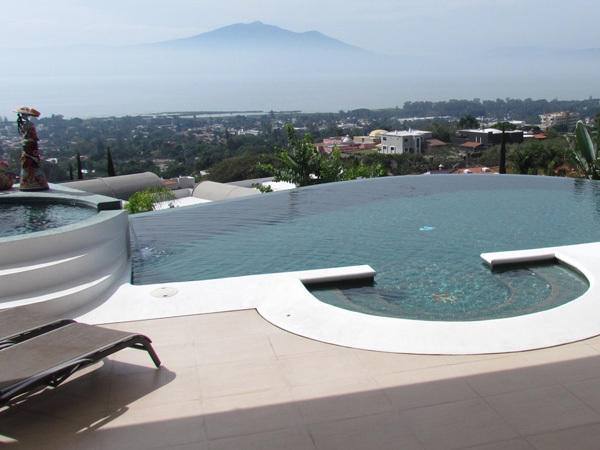 John and Patricia recently completed a multi-year project of designing and building their magnificent home in Upper Ajijic. The doors to the patio open nearly the length of their living area. They should put their house on the “home tour” because of its eloquence and views to die for. 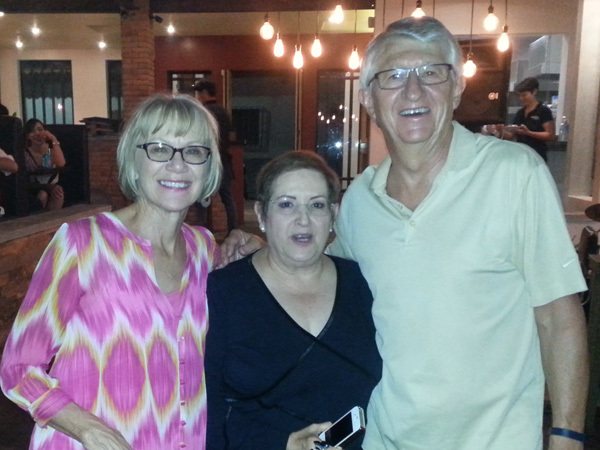 Yvonne, one of our friends who was born and grew up in Guadalajara joined us for a Monday night of dining and dancing at Adelita’s. She moved from Guadalajara to Ajijic and lives no more that a few blocks from our place. Even though we lease, we are making sure that it will be in better shape when we leave than it was when we arrived. 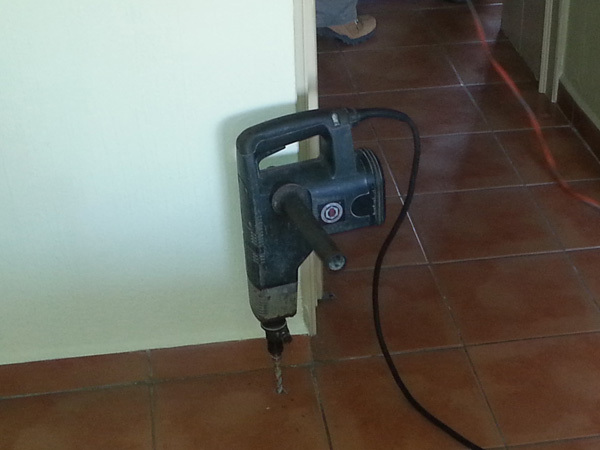 Here workman are drilling holes in the floor and filling them with chemicals to eliminate termites. We attended a Snowbird Welcome Back Party at Manix Nightclub. 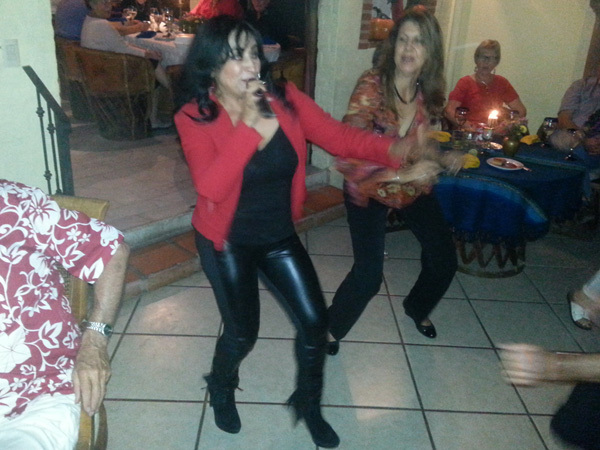 Here Blanca, one of the entertainers, was both singing and dancing to Chubby Checkers “Twist Again, Like We Did Last Summer”. It is sure great to have our snowbird friends returning for another season. 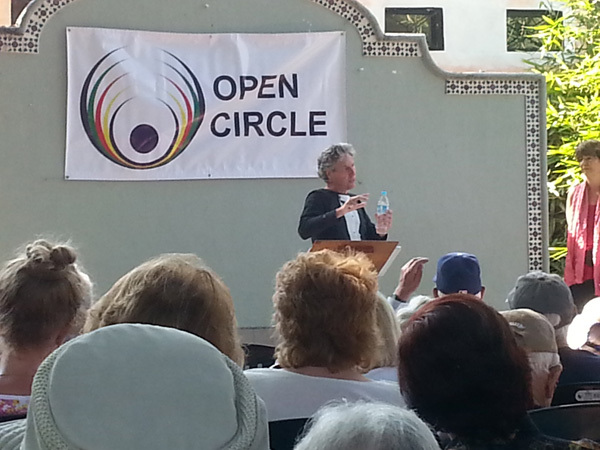 Our friend John was a presenter at Open Circle one Sunday. His thought provocative talk included stories of his personal spiritual journey and excerpts from "Waking Up: A Guide to Spirituality Without Religion" by Sam Harris, on secular spirituality and meditation. We went on a “Behind the Walls Home Tour” and walked through several beautiful homes along the foothills of Ajijic. Can you imagine doing dishes with this view. 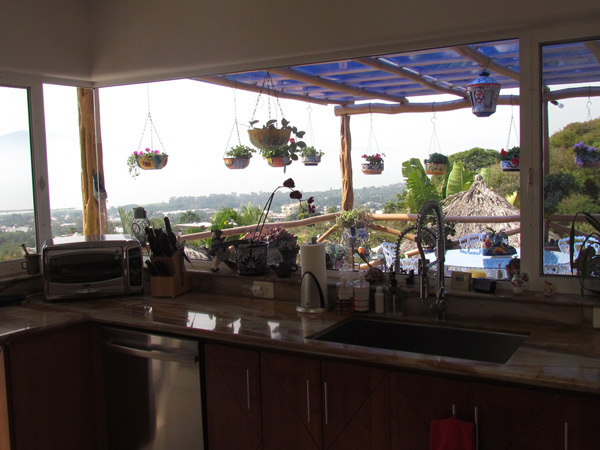 They would be the cleanest dishes in all of Mexico—standing there wiping while marveling at the vistas below. This is another reason so many foreigners flock to Ajijic. 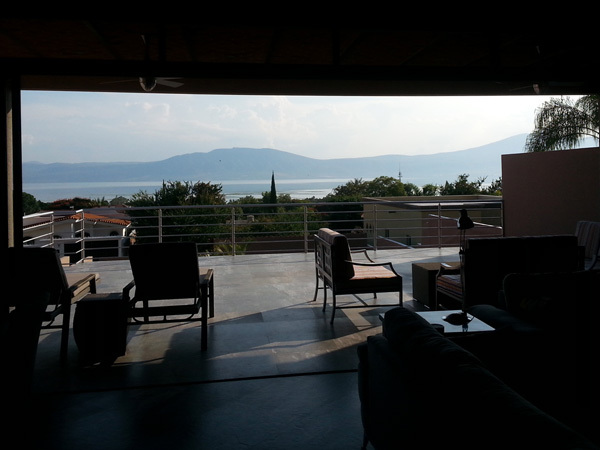 Besides the great architecture and fabulous furnishings, one common quality of our home tour was the fantastic views they have of Lake Chapala and the ancient volcano that is seen here peeking above the clouds. 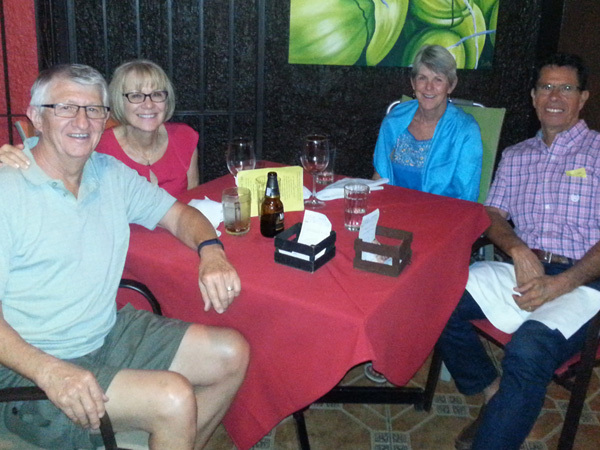 We got a chance to catch up with friends David and Karen for dinner one evening. Karen and Glorine were comparing notes on all the doctoring on back, knees and feet that each have been going through over the past year. Thank goodness that both are on the mend and on to full recovery. 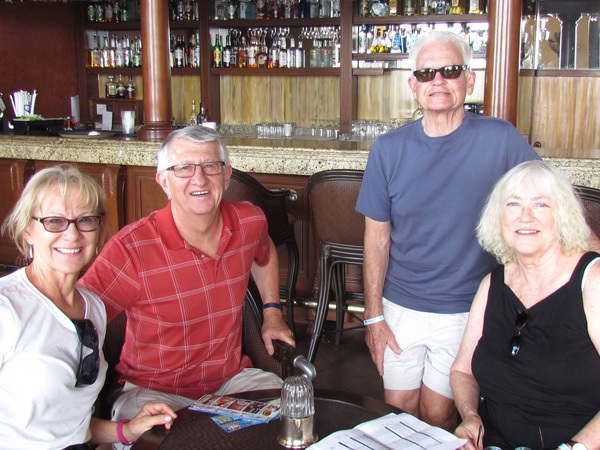 We met up with our hosts, Chuck and Jean, for a six day stay in Cabo. This is one of many times we enjoyed meals or just cocktails together. The resort had four decadent restaurants to choose from—Asian, Mexican, Italian, and The Bistro along with a deli and this wonderful Lobby Bar. One day as we were walking along the beach, we took this picture of the resort from the ocean side. 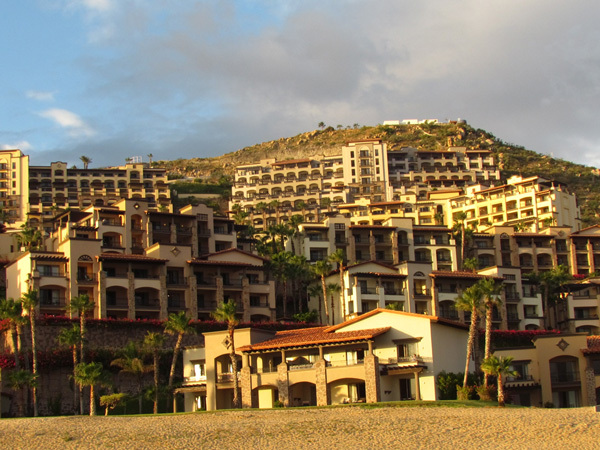 The resort is built on the side of a mountain and consists of 30+ buildings, each with phenomenal views of the ocean. Here is the view from above in The Lobby Bar overlooking the ocean and the resort’s steep, narrow pathways that interconnect all the buildings within the resort. From different vantage points, one can see many of the pools and hot tubs. 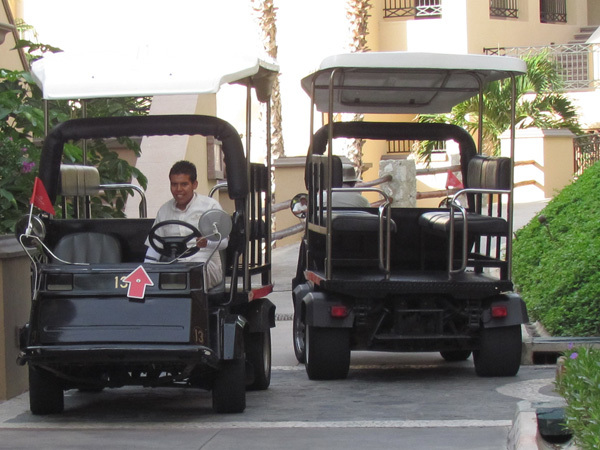 These three-cylinder carts were our main source of transportation from our suite to other parts of the resort. We never waited more than five minutes until some young man would cruise by ready to take us on a ride through hair pin turns to explore other parts of the resort. 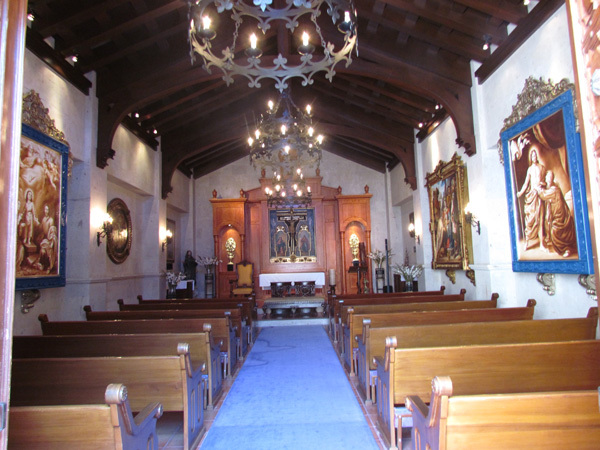 As we toured the resort, we found this little chapel used for not only Sunday Mass but also weddings and anniversaries. In fact, while we were going to the spa one afternoon, we saw a cute little flower girl, followed by the bride with a 10 foot veil/train, being held by an equally cute young boy. 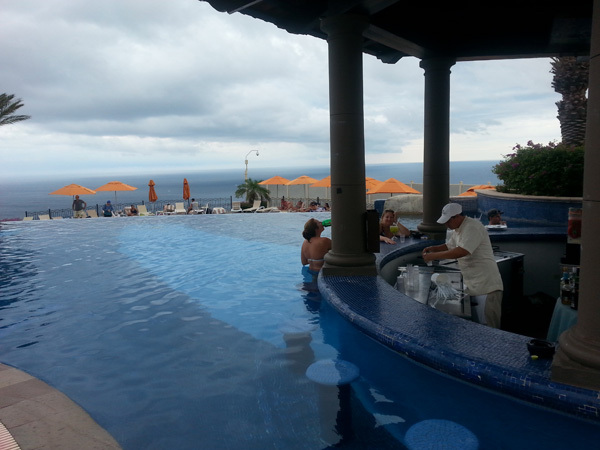 The resort has seven enormous swimming pools, four of which had Aqua Bars and Grills. This made it extremely easy for us to enjoy a quick bite and an even wider array of cocktails. Just after this picture was taken, it cooled down considerable and started to rain--the beginning of Hurricane Sandra. 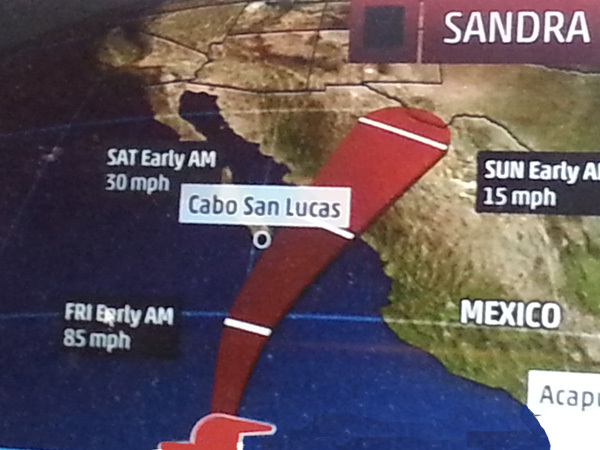 Hurricane Sandra was churning out in the ocean about 150 miles south of Cabo. While some of the downtown businesses buttoned up for possible damage, the most we got were overcast skies, some rain and a little bit of wind. 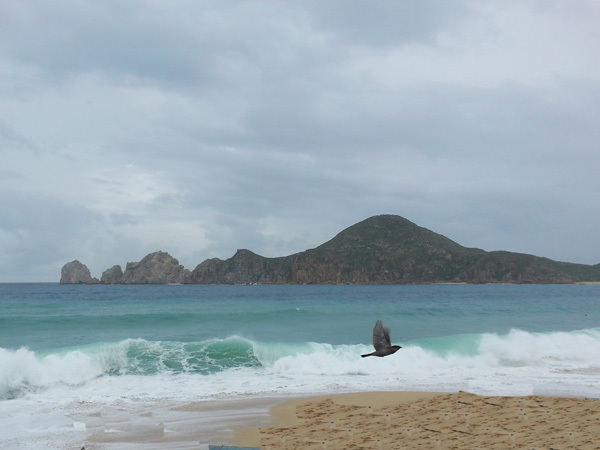 Like Hurricane Patricia, Sandra began as an intense storm, but fizzled out before hitting land. The port at the marina in Cabo was closed so all boat cruises were shut down for a couple of days. Cabo is Spanish for cape and the peaks off in the distance are the extreme southern end of the Baja and the exact point where the Sea of Cortez and the Pacific Ocean comes together. 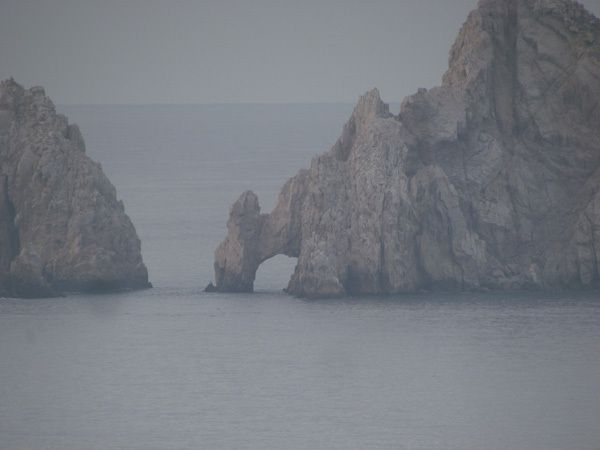 A closer view of the cape shows this natural rock formation called The Arch of Cabo San Lucas, also known as Lands’ End or by local as El Arco. This picture does not do justice to how huge these rocks are. It is said to be a great hang out for seals. 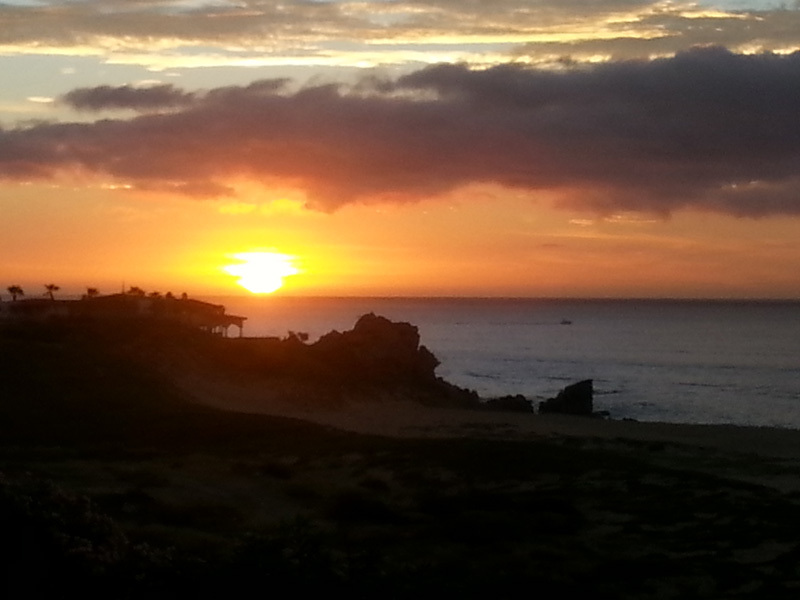 One day we rented a car and followed the Pacific Ocean about an hour north to the small village of Todos Santos. 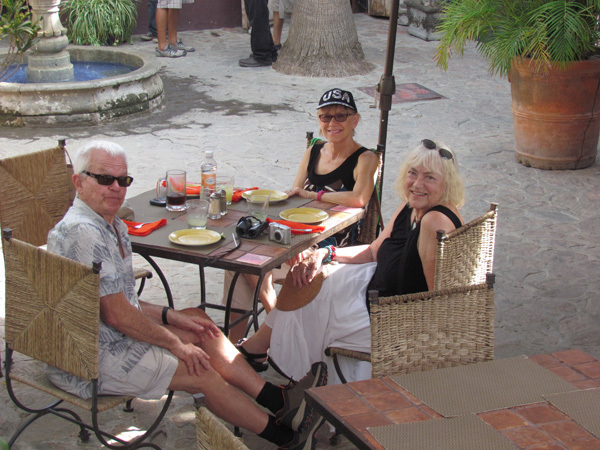 It is much quieter than Cabo and a prime location for snowbirds who want to escape the busy life or cold winters up north. 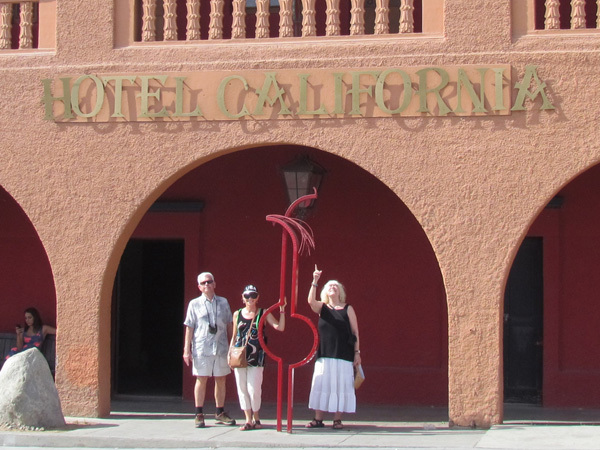 Here we discovered Hotel California. 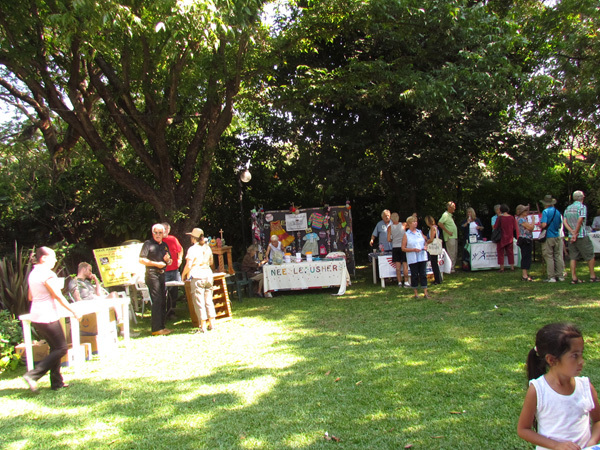 After touring the church and some local stores, we enjoyed Glorine and Jean’s picnic lunch on the plaza. We then returned to the Hotel California and discussed the Eagles hit song and other great music that came out of the 60s and 70s over a Margarita or two. Each day for a week we got a chance to take in this view and be reminded how great it is to be retired and have the luxury of placing ourselves anywhere in the world and enjoy the company of good friends. 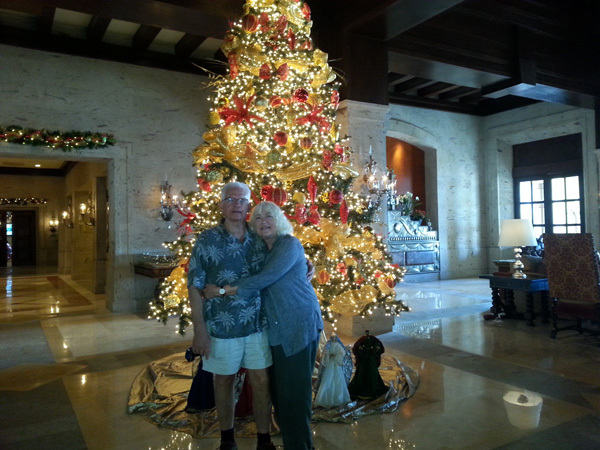 The resort lobby had this spectacular Christmas tree on display. As we were capturing some lasting memories of it, we were telling Chuck and Jean how happy and grateful we were in spending Thanksgiving with them. November's web page includes November 1 through November 30.